A thrilling conclusion to Lara’s origin trilogy. What is it? The final chapter in Lara Croft’s origin trilogy. 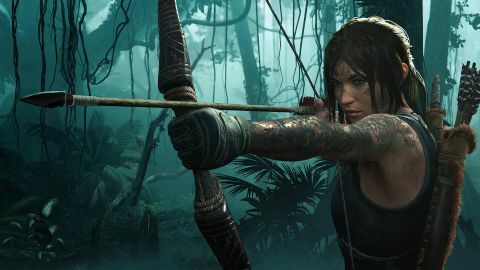 It’s in the moments of quiet spectacle where Shadow of the Tomb Raider is most compelling. Emerging from a dark, claustrophobic cavern into a grand Mayan temple glittering with gold and jade. The immense stone face of some forgotten deity looming ominously over you. A village resting in the shadow of a vast, dormant volcano. Ancient mechanisms whirring to life as you awaken a slumbering tomb. It’s a world that aches to be explored. Normally when Lara Croft finds an artifact it’s your reward for surviving a treacherous journey through a trap-ridden tomb. But the ornate dagger she plucks from a stone pedestal early in this game is a different story. It triggers a series of devastating cataclysms, including a flash flood that destroys an entire city, and she travels to the jungles of Peru to try and stop the apocalyptic prophecy she unwittingly helped fulfil. And it’s here where she finds those incredible tombs, temples, and towering tributes to the gods. The sense of place and scale in Shadow is frequently astonishing. The places you visit feel genuinely ancient, mysterious, and dangerous. Every crypt, chamber, and corridor is decorated with detailed murals and elaborate carvings. These exaggerated, dramatic structures could never exist or stay hidden in reality, of course, but their size, complexity, and theatricality give the game the feel of a pulpy adventure story. It’s ancient history as taught by Indiana Jones, not Simon Schama. As well as looking impressive, these ruins also give you intricate, room-sized puzzles to solve. These showcase some of the game’s best design, and although the solutions are never that difficult to figure out, the feeling of cracking these massive puzzle-boxes is hugely satisfying. One involving a rotating pillar in a skyscraper-sized chamber, where you use ropes and wind-powered machines to make your way to the top, is particularly entertaining. But the smaller interactions are fun too, and have a nice feeling of physicality: things like deciphering obscure hieroglyphs, navigating dark underwater labyrinths, rotating chutes to guide streams of water, or igniting pools of oil. If Shadow of the Tomb Raider was nothing more than a series of beautiful locations filled with puzzles like these, I would have been happy. But the presence of Trinity, a villainous, artifact-hunting paramilitary group, means Lara has to get her hands dirty in combat from time to time. Thankfully, standard firefights are kept to a minimum, and most of these encounters involve smearing yourself in mud and creeping around choking people like a tiny, posh Rambo. The amount of cover provided is too generous at times, but there’s something grimly empowering about skulking through the mud and filth, silently killing off guards as their buddies are whipped up into a panic. Stealth is, in general, much better than it was in previous games. If you’re spotted an alert meter above an enemy’s head will start to fill up, but if you manage to break his line of sight and hide before it does, you’ll be safe. And there are a few neat ways to screw with the AI too, including the wildly entertaining fear arrows. Fire one of these poison-tipped arrows at an enemy and he’ll start hallucinating and madly firing his weapon at anyone nearby, friend or foe, before collapsing in a confused, sweaty heap. You can also hide in the trees and string enemies up in the jungle canopy with a rope. Lara is basically Batman and the Predator rolled into one now, which jars a little with the game’s efforts to paint her as a flawed, human character. Performance I played the game at 1440p/60fps, max settings, on a GTX 1080/i5-6600K/16GB RAM PC. Some frame drops in really busy areas, but never frequent enough to make me lower any settings. You'll naturally need a better GPU to play this at 4K. All the way through the previous game, Rise of the Tomb Raider, I groaned every time I had to slog through yet another boring gunfight. But in Shadow the action set-pieces are well spaced out and, with a few notable exceptions, mostly entertaining. Playing it like a regular third-person shooter is much more difficult now, even when Lara upgrades her arsenal with shotguns and assault rifles, meaning stealth is usually the best option. There are some low points, though. An enemy introduced later in the game turns it into a brainless, tedious shooter, loudly telegraphed by the abundance of shotgun ammo littered around the level. And the underwater stealth sections where you have have to hide from shoals of hungry piranha are every bit as terrible as they sound. The world is large and interconnected, with areas that are inaccessible until you locate a certain piece of gear, and you have the ability to fast travel between campfires you’ve lit along the way. There are also a few atmospheric hubs including a gorgeous, lively mountain city called Paititi. The world-building in these regions is fantastic, and wandering around talking to people (and petting llamas) is a pleasant change of pace. You can pick up side missions here too, helping locals with their troubles, but I never found any of them to be that interesting. There’s a lot of stuff to do in Shadow: killing animals to craft new outfits, scavenging for materials to upgrade weapons, uncovering hidden crypts. But it’s the challenge tombs—big, fun, self-contained environmental puzzles with a prize at the end and a story to uncover through diaries and artifacts—that remain the most gratifying and worthwhile side activity. Over the course of three games, the rebooted Tomb Raider has developed its own distinct visual language. If you see a pockmarked wall, you know you can use the climbing axe on it. A smear of white paint indicates a surface that can be climbed or grabbed. An object wrapped in rope can be pulled down or tethered to something. This gives the game an undeniable flow, because you immediately know what to do when you see one of these cues. But it can make exploration feel inorganic and prescribed, almost as if you can see the level designer placing each object. A welcome new feature in Shadow is being able to reduce or completely remove some of these elements, however, making exploring and puzzle-solving much more challenging and involved. Swimming plays a bigger role in Shadow, with the addition of air pockets allowing for longer underwater sections. Tombs will often have submerged areas, forcing you to dive to dislodge jammed machinery or locate items that have fallen into the depths. Lara has a large skill tree to work through, and spending points on increasing her swimming speed and breathing capacity makes going underwater a lot more enjoyable. You can also attach a rope to a climbable surface and rappel down from it, or use it to swing across a gap. Jumping can feel a tad weightless and imprecise, but the sheer number of ways to traverse the environment makes up for it. Standing at the bottom of some massive structure and wondering how you’ll get to the top is always an exciting moment in Tomb Raider, and there’s a lot of that here. Lara is a more capable, confident hero this time around, but still has moments of self-doubt and frailty that manage to give the story some heart. This is cheapened slightly by the gruesome guerrilla violence of the combat, where she mercilessly stabs, drowns, and shoots people with nary a glimmer of remorse or disgust. But hey, it’s a videogame. Shadow is unashamedly a blockbuster, with some action set-pieces—fleeing an exploding oil refinery, hopping across debris in a flooded city—that are terribly exciting, but not very interactive. And that’s fine, because there’s enough agency elsewhere in the puzzles, stealth, and exploration that I can forgive those moments where the game slides into full-on absurd Hollywood nonsense mode. Even at its dumbest, the lavish production values make this stuff a thrill to sit back and watch.